The No. 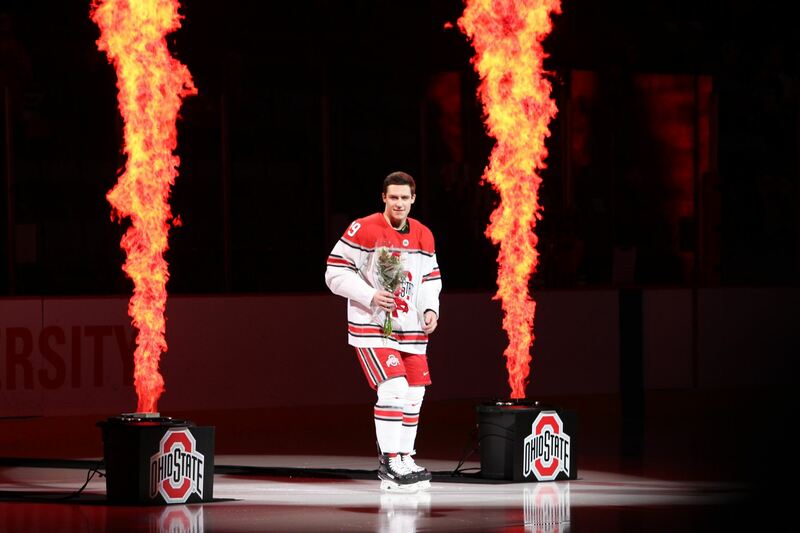 6 Ohio State men’s hockey team began Saturday night honoring six seniors for Senior Night before the start of its game against Wisconsin with their families and a video tribute as a thank you to the time spent in scarlet and gray uniforms. The night ended with the Buckeyes (21-8-5, 14-8-2-1 Big Ten) sending those seniors out victorious with a 4-0 win against the Badgers at the Schottenstein Center, finishing off a series sweep of Wisconsin (14-17-4, 8-13-3-1 Big Ten). The Buckeyes beat the Badgers 6-2 Friday. Senior forward Christian Lampasso said it is not the end, but the beginning of a special postseason run. The Buckeyes had two goals each from junior forward Mason Jobst and Lampasso. 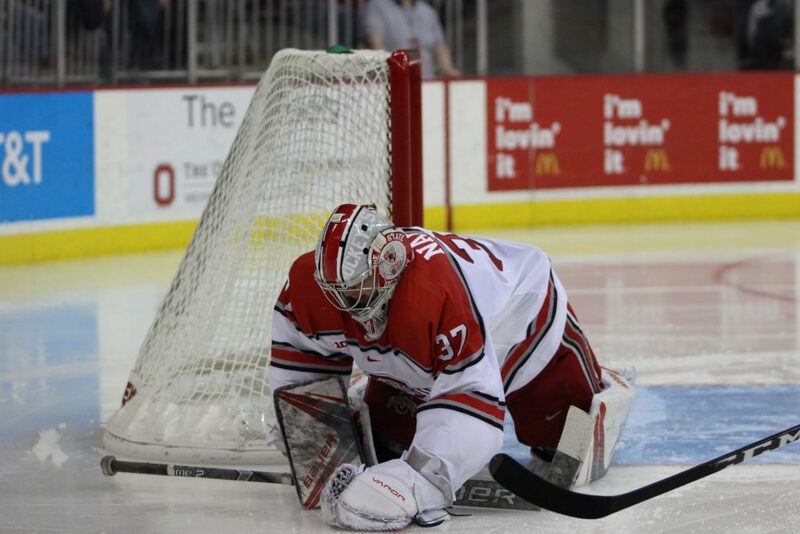 Freshman goaltender Tommy Nappier delivered a 31-save shutout, the first of his career. Nappier was quick to credit the team in front of him. Nappier can get lost behind the shadow of redshirt junior goaltender Sean Romeo, but has quietly posted outstanding numbers as the backup this season. Nappier has won all four starts in his first collegiate season. The Buckeyes used a three-goal second period, pressing the Badgers’ power play into giving up a shorthanded goal and another goal just as a penalty ended. The first period started with a tight-checking physicality, which made it difficult to generate offense and space. Nappier was the busier of the goaltenders in the period, with the shots favoring the Badgers 11-7. Wisconsin began the second period taking a penalty that fueled the Buckeyes’ potent offensive attack. At 6:43 of the second period, Jobst broke the scoreless tie when he received a pass from junior forward Brendon Kearney and put it through the legs of Wisconsin sophomore goaltender Jack Berry. With the Buckeyes shorthanded, Jobst took a pass from junior forward John Wiitala on an odd-man rush and roofed it over Berry’s glove hand for his second goal of the game to double the Buckeye lead. A little more than a minute later, Lampasso streaked right to the net and sent the puck past Berry for a 3-0 lead. Kearney added his second assist of the night on the goal. Ohio State dominated the period on the scoreboard and in the shot clock with a 13-8 advantage in the second period. Lampasso added an empty-net goal in the third period. Both teams finished with 31 shots on net. Berry had 27 saves on 31 shots in the loss for Wisconsin. Ohio State will face Michigan State in the first round of the Big Ten tournament in a best-of-three series on Friday, Saturday, and Sunday, if necessary. All games will start at 7 p.m. at the Schottenstein Center.